Charlotte Crist, co-owner at Gators and Ghosts, is happy to assist you when you visit our booth at 500 Bourbon Street in the French Quarter of New Orleans. We're there 10 a.m. to 6 p.m. 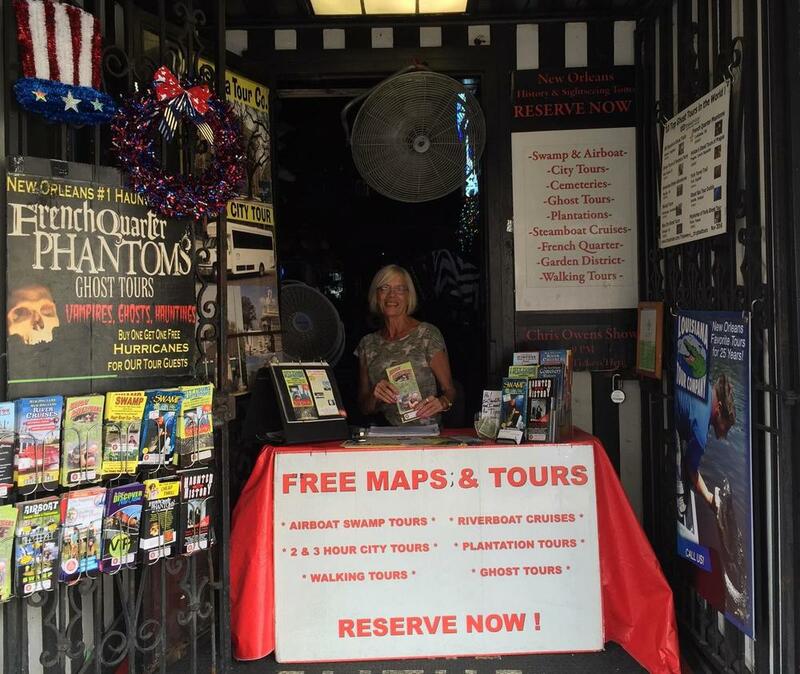 When you come and see us at 500 Bourbon Street in the French Quarter, we have more than 100 tours available: airboat swamp tours, ghost tours, cemetery tours, sightseeing bus tours of New Orleans, riverboat cruises, plantation tours, bike tours, segway tours, garden district tours and more. We recommend only the best tours in New Orleans. We partner with more than 25 different New Orleans tour companies and personally attend as many tours as possible so we can make better recommendations for you. Below is a list of our favorite New Orleans sightseeing tours that we offer. Many can be booked online, but some of these tours must be booked directly by phone. Call 888-481-8188, text 504-226-5433 or email reservations@gatorsandghosts.com for Reservations and More Information. Our most exciting and luxurious tour package. Do this tour over two days. Go on a thrilling and intimate tour of the bayou on our smallest and fastest airboat and then visit both Oak Alley and Laura plantations. Includes hotel pickup. Book as far in advance as possible. $187. Call 888-481-8188, text 504-226-5433 or email reservations@gatorsandghosts.com for Reservations and More Information. You can do this combo tour all in one day! 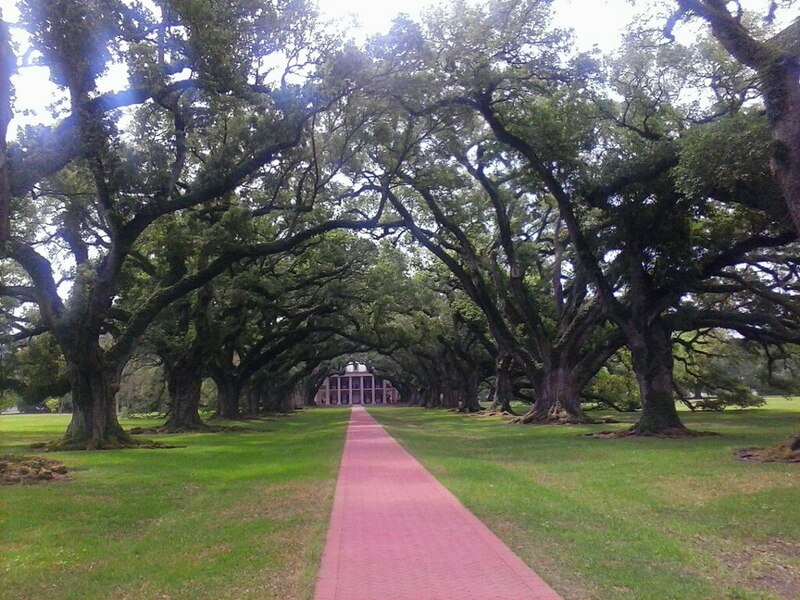 We will pick you up at 8:30 a.m. for the New Orleans Plantation Tour of your choice, either Oak Alley Plantation or Laura Plantation. Then you have your choice of New Orleans Airboat Tour, either our 16 passenger Medium Airboat or our intimate 6 Passenger Small Airboat. You'll return to New Orleans by 5 p.m.
16 Passenger Airboat and Single Plantation: $137 per person. 6-9 Passenger Small Airboat and Single Plantation: $157 per person. 8:30 a.m. to 5 p.m. daily. Call 888-481-8188, text 504-226-5433 or email reservations@gatorsandghosts.com for Reservations and More Information. A great way to get off Bourbon Street and see the real city: covers the French Quarter, the historic and beautiful Garden District, City Park, St. Louis Cemetery no. 3, the Lower Ninth Ward (where the levy broke during Hurricane Katrina) and more. Includes hotel pickup. $45 to $49. 8:30 am, 9:30 am, 12:30 pm, 1:30 pm, 3:30 pm. This is the best general sightseeing tour in New Orleans. Click here for Reservations and More Information. See alligators on this half thrill ride, half eco-tour, with fearless Cajun captains leading the way. Airboats get you deeper in the bayou than any other kind of boat. Pontoon and other types of boats also available (but the airboat is the most fun!). Optional hotel pickup. Prices vary based on type of boat and transportation needs. Airboats: $50 to $95. Pontoons: $29 to $52. Book as far in advance as possible. This tour sells out fast. Pickup begins at 8:40 am, 10:45 pm, 12:45 pm, 2:45 pm (seasonal March-Oct.) and sometimes 4:45 pm (call us for availability). Drive out: 9:45 am, 12 pm, 2 pm, 4 pm (seasonal March-Oct.) and sometimes 6 pm (call us for availability). Click here for Reservations and More Information. 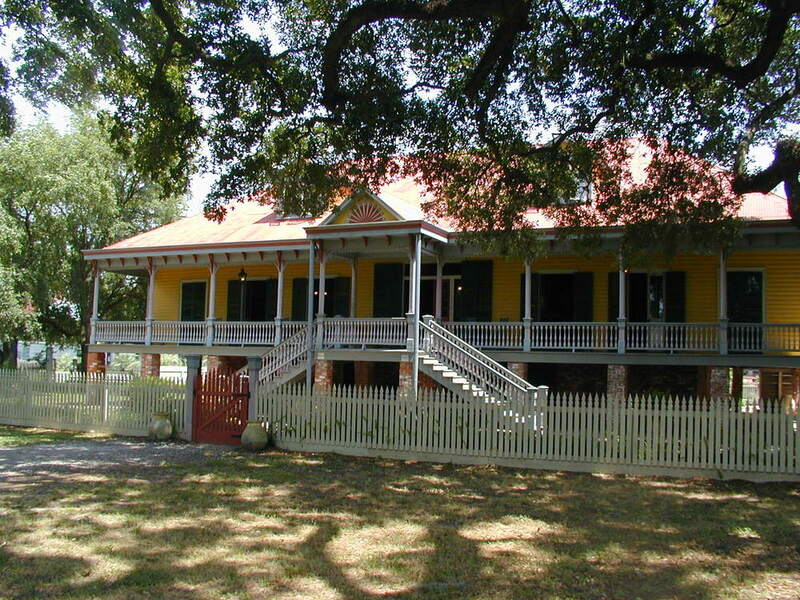 A Creole plantation that was run by three generations of women, with an extensive tour of the big house and original slave quarters. A very well thought out and presented historical tour. Includes hotel pickup. 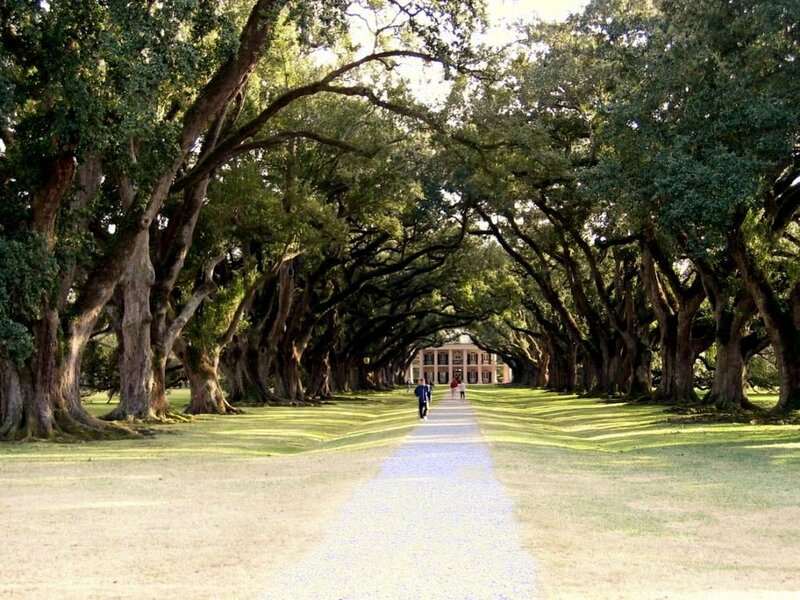 Oak Alley plantation is also available; or visit both for a full day of plantation touring. $67 to $92. Single plantation: 8 am, 12:30 pm. Double plantation: 8:30 am, 10:30 am, 12 pm. Call 888-481-8188, text 504-226-5433 or email reservations@gatorsandghosts.com for Reservations and More Information. Do a swamp and a plantation all in one day at a great price. Swamp tour on pontoon boat; choice of Laura or Oak Alley plantations. Hotel pickup included. $98, 10:30 am. Call 888-481-8188, text 504-226-5433 or email reservations@gatorsandghosts.com for Reservations and More Information. The haunted New Orleans tours offered by Gators and Ghosts are bone-chillingly awesome! You’ll hear tales of famous French Quarter murders and fires that led to ghost stories and unrestful spirits. It's history mixed with the supernatural. Our tours start and stop at a bar (but folks under 21 are still allowed). $16 to $25. 5 p.m. 6 pm, 8 p.m. Click here for reservations and more information. The oldest cemetery in New Orleans features voodoo queen Marie Laveau’s grave, plus the above ground tombs of 100,000 others. Beautiful and historic. $16 to $25. 11 am, 1 pm. Call 888-481-8188, text 504-226-5433 or email reservations@gatorsandghosts.com for Reservations and More Information. A lovely ride up and down the Mississippi river on a paddlewheeler. We have lunch and dinner cruises available. Most cruises include a jazz band and optional food. $34 to $83, 9:30 am, 1:30 pm, 6:30 pm. Call 888-481-8188, text 504-226-5433 or email reservations@gatorsandghosts.com for Reservations and More Information. Perhaps the most beautiful neighborhood in New Orleans, the Garden District is known for its opulent homes and lush gardens. A number of celebrities have lived there over the years, including Sandra Bullock, John Goodman, and Anne Rice. Beyonce just bought a home here! The Garden District also features Lafayette Cemetery, one of the most historic cemeteries in the city, and Commander's Palace, one of New Orleans' most famous restaurants. $20. 10:00 a.m. Call 888-481-8188, text 504-226-5433 or email reservations@gatorsandghosts.com for Reservations and More Information.